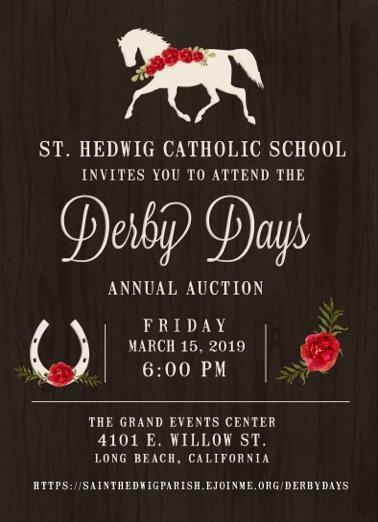 For more than 30 years, St. Hedwig's annual auction has been the school's primary fundraiser. This one special night helps us keep tuition affordable and provides the much-needed resources to stay competitive in an ever-changing environment. Over the years, funds have been targeted to upgrade classroom and playground equipment and an air-conditioning system. Last year’s event raised over $115,000 for a dynamic STEM curriculum for students in Kindergarten through 8th grade. This year we're raising the paddle for renovations to Quinn Hall. Our students deserve a safe place to gather and play. This year’s theme is the Derby Days. For more information on ways to support our auction — including tickets, sponsorships and donations — visit our auction website.